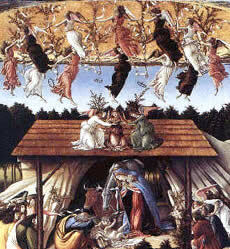 Sandro Botticelli's "Mystical Nativity," 1501.
with a circle of winged beings floating beneath it. Why does "mainstream" science continue to deny the historical and on-going existence of Extraterrestrial contact with human beings on Earth? Why do science programs on Television, and in other mass-media foray like magazines, continue to maintain the apparent 'fiction' that humanity is still in search for intelligent life in the universe beyond Earth? With that in mind, as far as modern religion, why does institutionalized Christianity correspondingly support this denial of Extraterrestrial contact, as manifested in "UFOs"? Ancient Gnostic disciples of Jesus critically illuminate this denial. Extraterrestrial denial within Western science and Christianity, manifests from a consciousness, in which human beings have been seduced to pursue materialistic power and oppression against one another. Gnostics suggest that this apparent seduction, has been amplified by Manipulative Extraterrestrials which Gnostics had sought to help warn humanity about. The Bible itself in pre-translated forms, as presented by Biblical scholars, actually contains specific warnings against these apparent Manipulative Extraterrestrials, who have apparently sought to control, exploit and oppress humanity, through mass-deception. However, translated forms of the Bible, including the notable King James Version, presumably directed by these reported manipulative entities, excluded the explicit warnings. "For our struggle is not against [human beings], but against the rulers, against the powers, against the world forces of this darkness, against the spiritual [dark forces] of wickedness in outer space." 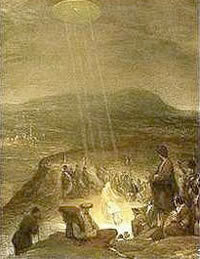 Aert de Gelder's The Baptism of Christ, 1710.
beings associated with an Extraterrestrial spacecraft in the sky shining rays of light on him. The acknowledgement of Extraterrestrial contact by Christianity and by "mainstream" science in the now industrialized West, would elevate the human consciousness in a manner that would empower humanity, relative to prospective positive and negative implications of Extraterrestrial presences. However, prevailing elites do not substantively seek to empower humanity, in spite of the public relations allusions to wanting the spread of "freedom" and "democracy". Christianity and "mainstream" science in the West have evolved as pillars of the maintenance of oppressive regimes, that substantively seek to perpetuate 'Empire', rather than spread human rights . Extraterrestrial denial in the industrialized West is a phenomenon of capitalist society, where elites seek to maintain their status, by repressing critical knowledge which would lead to a society freed of elitist oppression. Capitalism, flourishes by maintaining greed driven commercial profits, based upon enforcing societal ignorance, that prevents the public from getting access to knowledge which might "dampen profits" from "consumer" demands. Maintaining ignorance about Extraterrestrials has become inextricably linked to the dysfunctional evolution and maintenance of an oppressive system of capitalism which thrives alongside individual ignorance. Christianity was created by elites, and in the guise of spreading the message of God, was executed to spread Empire through the creation of an elite-driven religious bureaucracy. Christianity was the tool that Romans, and other Empires since then, have used to pacify and oppress "the masses". Western "science" became the secular mechanism used by the 'Empires' of the West, to correspondingly oppress the masses through the development of destructive technologies associated with a political-military-industrial complex, and through manipulated "official" pools of knowledge. These highly managed pools of knowledge are under elite ownership. These managed pools of knowledge are also collusively directed in the capitalist system, through formal educational systems, broad socialization, and interconnected mass-media organizations from television to the print media. In reality, the spreaders of Christianity and "mainstream" science in the evolution of the industrialized West were pursuing a collective agenda, to maintain oppressive power, which required denying Extraterrestrial contact. The apparent conflict between "religion" and science, is a managed conflict and is a mass deception strategy through political theatre, which is orchestrated to give the appearance of an uncontrolled and critical debate. In reality, both sides of that debate are controlled by the same confederacy of elites, who are linked to the joint pursuit of 'Empire', through the opportunistic use of religion and science under capitalism. Those seek to oppress "the masses", and to subvert a critical empowering awareness of the humanity identity in the Universe, relative to Extraterrestrials. Revealing an Extraterrestrial presence by modern science and institutionalized Christianity, would inspire a Gnostic-like awakening, including a re-appreciation of the human identity in relation to God. Indeed, ancient Gnostics appeared to view the God associated with the evolution of Christian dogma as a "false God", created under the influence of what was referred to as the Manipulative Extraterrestrials associated with the Old Testament (and other religious systems cultivated by repressive Empires on Earth. These reportedly include the gods of pre-"Christian" Rome, and Egypt), and other such religious-based oppressive Empires. from article in Fate Magazine 1999. Gnostics appear to view God as the original creative consciousness of our Universe, associated with Free Will. 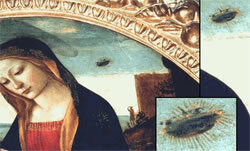 'Aeons' were the messengers of God, manifested through enlightened Ethical Extraterrestrial contact on Earth. In contrast, the 'Archons' were the "fallen angels" which had also been originally created by God, but through Free Will, chose to rebel against God, by choosing a greed-driven path which sought to conquer this Universe. It appears that these "fallen angels" became what Gnostic referred to as 'demons' influenced by "lower dimensional density" Extraterrestrials from outside of this Universe. The elements of these apparent de-evolved Manipulative Extraterrestrial "demonic consciousnesses" sought to attract to other "hideous intelligences" through this universe, which apparently included those on Earth. In so doing, the collectives of these negative consciousness, sought to enslave planetary Civilizations with the use of co-operating elites from the Civilization. The result of this collusion would be eventual enslavement of sentient beings and total planetary environmental destruction from over-exploitation. The Madonna with Saint Giovannino, century, by Domenico Ghirlandaio. What are the man and dog looking at? It is a dark object that appears to be glowing or exploding. there is another object that looks to be exploding and some smaller objects beneath it. In the apparent Gnostic view, Manipulative Extraterrestrials or 'demons', are beings from a physical from a "lower dimensional density" referred to in a Biblical context as "Hell". In other words, in the apparent Gnostic view, these 'demons' are literally beings from "Hell" which seek to take away destroy the God-driven souls of beings, through predatory materialistic seduction, and if necessary, outright coercion in their drive for 'ego' not bounded by ethical considerations connected with God. Gnostics appear to recognize a now manifested conflict in the universe between sentient beings in a universe of Free Will, who have chosen a path of empathy with God, as compared to those beings associated with "demonic consciousness". Gnostics conceive of a demonic consciousness which in an apparent agenda to conquer our universe, seeks to malevolently seduce and eventually rob souls, which carries the spirit of God. Earth has become somewhat of a microcosm of that conflict, in which notions of "good", and "evil" in the form of so-called "sin" have been appropriated by "demonic consciousnesses", for their own purposes. It is apparent that a "demonic consciousness" through the so-called "War on Terror", seeks to manipulate the public perception of the will of the apparent emissaries of demons to male them seem as being "good"; and to label seekers of peace, critical knowledge, and social justice in the spirit of God, as being "evil". This apparent demonic consciousness seeks to dis-orient humanity into apparent service to predatory 'demonic entities', that reportedly thrive from the manifestations of 'negative energy' created by the hideous intelligences on Earth that artificially create, war, violence, and racism. 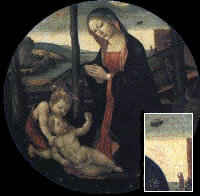 A UFO-like object in the sky shines a beam of some kind down on Mary's head. Extraterrestrial denial, is a societal psychosis in Western society which is aimed at the concealment of the apparent "demonic" consciousnesses, which now drives Western capitalism throughout the world through "Globalization". Indeed, theologist Dr. David Ray Griffin directly referred to this apparent "demonic" consciousness, as having motivated apparent neo-conservative 9/11 ambitions, and other schemes of global oppression. "demonic consciousness, with 'the demonic' understood as an emergent reality that is diametrically opposed to the creative power of the universe and strong enough to threaten its purposes." To explain how demonic power can arise in a monotheistic universe, Professor Griffin uses the philosophy of Alfred North Whitehead, with some help from Carl Jung. Then to explain how demonic evil arose historically, David Ray Griffin employs ideas from Andrew Bard Schmookler's Parable of the Tribes. Extraterrestrial denial also serves to frustrate the spread of messages by Ethical Extraterrestrial beings, like apparently Jesus, and other spiritual messengers, who sought to inspire the liberation of humanity from influence by "demonic consciousnesses". These "demonic consciousnesses" in the apparent view of the ancient Gnostics sought to pursue an apparent agenda of coercion and mass deception through blinding dogma. This blinding dogma is designed to mislead humanity away from understanding the God as the eternal light of being from within humanity, as manifested in part, by Mother Nature. Religious dogma further misleads humanity into believing in "religious saviors". By creating "religious saviors" as expressed in the apparent corrupting of the legacy of Jesus through 'Christianity', elites sought to dis-empower social responsibility among humanity for each other, in the context of social justice, and to turn them into people having "faith" in the guidance of society under oppressive elites. The consciousness of Manipulative Extraterrestrials seeks to repress vital spiritual knowledge associated with acknowledging the existence of historical and on-going Extraterrestrial contact with humans. Manipulative Extraterrestrials apparently deploy, in the very emissaries which seek to oppress humanity, the use of controlling dogma, and "faith" among the masses. Ancient versions of the Bible once contained warnings about Manipulative Extraterrestrials, and also acknowledgements of the inspiring messages of Ethical Extraterrestrials cited by the Gnostics. The clique which sought to hijack the legacy of Jesus, in order to form a "Christian religion", based around the Bible as its principal text, sought to ban messages, which Gnostics recognized. This clique, sought to ban these messages, and to create a dogma which could be used to dis-empower "the masses". In the process, this clique wanted to create dogma which would complement their pursuit of power, within the framework of what the Gnostics represent as an oppressive "false God". ...as seeking to liberate humanity from the Old Testament "false God"
One of the most sensational ideas of the Gnostics, is that Jehovah, the Father God of the Judeo-Christian religion, was an Archon, or more specifically, an impostor deity, not to be confused with the true messengers of God, called Aeons, who inhabit the cosmic centre (galactic core). "Jehovah is said to be blind and mad, a demented alien who nevertheless has some god-like powers. Although he does not create the world we inhabit, he believes that he does. "Opening his eyes, the chief Archon saw a vast quantity of matter without limit, and he became arrogant, saying, 'It is I who am God, and there is no other power apart from me.' "
Of course, this is exactly what Yahweh-Jehovah says in the Old Testament. "Yahweh-Jehovah could be viewed to embody as consciousness of materialism, related to self-absorbed venality, ego ,which separates humanity from appreciating their spiritual essence and vitality." Fortunately, the Nag Hammadi cache, meager as it is, contains quite a lot of clear information on the Archon God and his insidious tactics. "The Archons devised a plan about me, to release their error and their absurdity." "The way to a man's belief is through confusion and absurdity." "the Archons induce a false plan of salvation into the human mind as counterfeit of the true path of self-liberation we can take by developing our innate potential of Nous, 'divine intelligence.'" The denial of Extraterrestrial contact with humans by elites, is indeed an absurdity, with an apparent context of mass deception. "openly ridicules Abraham, Moses and the prophets for accepting the 'Archons' as divine and putting faith in an impostor god who works against humanity." "a great deception upon the human soul, making it impossible for humans to find Nous, the self-liberating mind, and thus come to know true humanity." The "doctrine of the aliens"
What Gnostics meant by "the Doctrine of the Aliens" is the ensemble of beliefs at the core of Judaic and Christian religion - and, by extension, Islam. All three of the "great world religions" derive from the revered Patriarch Abraham, (thought to have lived around 1800 BCE). Because the history of the ancient Hebrews is taken as exemplary or symbolic of humanity as a whole, our species' "sacred history" begins with Abraham, but Gnostics considered that Abraham was a dupe, the psychological "vector" for the intrusion of the Archons. In effect, Gnostics articulately and critically trashed the notion of a "Divine Plan" overseen by Jehovah, and exposed Judeo-Christian salvationism (the Redeemer Complex) as an extraterrestrial religious ideological system, alien to the Earth and hostile to human potential. 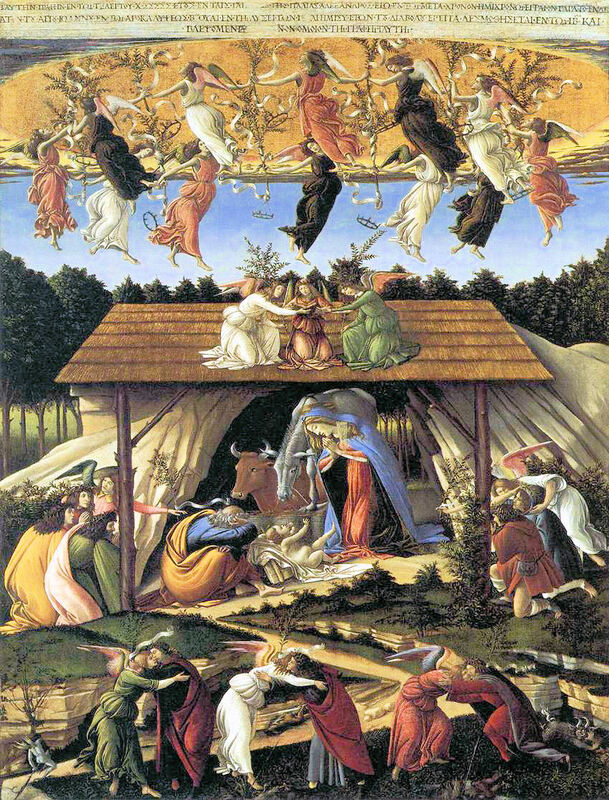 Indeed, according to these scholars, in the compilation of the Bible, words like 'messenger', referring to alien messengers were changed to 'angel', and words like 'sky', referring to Jesus coming from the sky and outer space were changed to 'heaven' in order to confuse and manipulate the masses around religious dogma managed by oppressive clerical elites, as emissaries to "Mammon". According to these critical historians, biblical texts critically reveal the spiritual, economic and political oppression of human beings to be the work of "evil alien gods allied with earthly rulers." "elemental human struggle against malevolent alien guided superpowers that is a central theme of the Bible [uncensored texts associated with the Bible]." Apparent ethically guided time-travelling Extraterrestrials appear to have sought to avoid the undermining and self-destruction of human civilizations by what are apparent Archon alien cults, called "religions". Who were the Gnostics in relation to spiritual knowledge and Extraterrestrials? The Gnostics were a group which sought to resist the attempts by apparent manipulative Extraterrestrials to use the creation of institutionalized religions like Christianity, to deceive "the masses". "present a complete and coherent description of the origin and methods of an inorganic predatory species called 'Archons'." Religious manipulators responded to Gnostic resistance by trying to take over Gnostic philosophy, with the imposing of a complementing system of elitist dogma. What is the source of Gnostic teachings? "is by definition a matter of knowing and not of believing. It is about enlightenment, not faith." To seek out and attempt to evaluate and appreciate Gnostic accumulated knowledge and teachings is only the first step toward prospective critical enlightenment. Beyond that, we must confirm what they knew by our own resources, our own faculties. "the living, ever-renewing cognition of the human spirit." The experience of "Gnosis" reveals to the initiated the divine spark within, which inspired as appreciation of God, that expresses itself human sprit within us, and in the awe and beauty of nature around us. Gnostics could be viewed to be a form of scientist, free of the corresponding dogma of much of today's prevailing corporate controlled scientific community, and who use those critical sensibilities to appreciate the complexity of reality, which holistically integrates appreciating the human spirit. Although Gnostic texts describe firsthand encounters with 'Archons' who "abduct souls by night", "their teachings do not emphasize physical threat. Rather, they warn that the Archons affect us most profoundly in our minds, especially through religious ideology, through beliefs about God and what God wants for us." 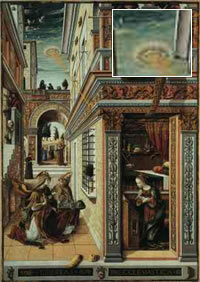 Gnostic disciples of Jesus do not deny the existence of Extraterrestrials like modern priests and ministers today. On the contrary, Gnostics not only acknowledge the existence of Extraterrestrials, including in particular, manipulative Extraterrestrials, but prescribe a method of defense. This defense prescribed against manipulative 'Archon' Extraterrestrials is cited in 'A Gnostic Catechism' and the commentary on the "First Apocalypse of James", Text 9 in the Nag Hammadi Reading Plan. The image of Jesus was not only transformed into being a "savior", but also racially transformed to complement the image of the oppressors. Jesus, who had been represented as being a black Jew by early disciples of Jesus, was transformed into to being a 'white' Jew by modern Christianity, in order to complement the "whiteness" of colonial masters, who sought to conquer Africa and elsewhere, in behalf of an apparent "demonic consciousness". In so doing, an apparent "demonic consciousness" sought to further appropriate the image of Jesus, toward a Euro-centric racist messianic message. In the apparent Gnostic view, Churches within Christianity, represent manifestations of materialism to a "false God", created through the deception of Manipulative Extraterrestrials which sought to deceive humanity into worshipping them. Gnostic wisdom suggests that the "true" God of the universe is manifested in the pursuit of a consciousness associated with wisdom, peace, and love, and also on Earth by Mother Nature or 'Sophia'. Native-Canadians and other indigenous peoples throughout the world who carry ancient spiritual wisdoms associated with an empathy of God, have been and continue to be subjected to genocide by an apparent demonic consciousness which embodies in the apparent Gnostic view, a "false God". This apparent "false God" is an apparent "demonic" deception, that aims to repress vital indigenous knowledge, which would liberate humanity from oppression. Manipulative Extraterrestrials apparently seduced many humans away from warning humanity, by using ego-driven promises of helping them achieve "unlimited power" to elites on their planet, through the pursuit of greed, and technologies which could enforce social control on their planet. The false manipulation of the legacy of Jesus into a "savior complex"
It is apparent that Jesus along with other spiritual messengers of a consciousness of God, sought to spread a message that human beings are all sons and daughters of God, and should treat each other accordingly. Jesus was not a specific seeker of religious deification. Instead, apparently according to Gnostic-inspired banned Biblical references, mischievous elites under the apparent influence of Manipulative Extraterrestrials, sought to "deify" Jesus to further execute an agenda of religious havoc on Earth. Therefore, the very efforts of Ethical Extraterrestrials to inspire an empowering human inner-spirituality, was apparently hijacked, by apparently falsely labeling Jesus as a "savior", by the very Manipulative Extraterrestrial influences which Ethical Extraterrestrials sought to countervail. In a Gnostic appreciative context, in association with broad elite social control, people were cajoled into believing in the idea of being "saved", and then accepted into "heaven" by following the dogma laid out by religious elites. Gnostics seem to suggest that Ethical Extraterrestrial "messengers" were time-travelers from a future space-time continuum who came to warn humanity on Earth of a path of oppression under the influence of Manipulative Extraterrestrials. These Ethical Extraterrestrials sought to apparently free humanity from religions systems created under the apparent influence of Manipulative Extraterrestrials that sought to deceive and oppress humanity. Gnostics sought to inspire knowledge of God, which encompassed a knowledge of both Ethical and Manipulative Extraterrestrials. Manipulative Extraterrestrials along with humans seeking to advance their own greed-driven power agenda, sought to keep knowledge of God away from "the masses". In the apparent view of Gnostics, these elites sought to repress this vital and empowering knowledge, through apparent Manipulative Extraterrestrial mass-deception techniques associated with the spread of dogma through "religion", and the parallel spreading of 'atheistic science'. The Old Testament of the Bible presents human beings as having been created in the image of God. Critical awareness of the diversity of Extraterrestrials created by a cosmic awareness of God reveals that Genesis is apparently inaccurate. Indeed, ancient Gnostics suggest that Genesis which embraced the Old Testament story of "Adam and Eve" is a creation myth originating from highly advanced Human Extraterrestrials. It is alleged that these Human Extraterrestrials sought to be worshiped as God, or 'gods', and saw humanity as some kind of interesting science project. Dr. David Ray Griffin, consistent with ancient Gnostics, also has written that the on-going execution of environmental destruction on Earth which includes Global Warming is also the apparent result of the intrusion of "demonic consciousnesses". Gnostics having viewed the Earth itself as an environmental sacred feminine-like womb, referred to as 'Sophia' for the prospective spiritual maturation of humanity, present such environmental destruction to be tantamount to defiling God, under the apparent guidance of Manipulative Extraterrestrials that correspondingly seek to exploit Earth. Religion as essentially societally acceptable cult groups and "official" science, under capitalism, are being used within that capitalist system, in the march toward "Economic Globalization", and a "New World Order". Religion and "official" science are also being both used to work against different levels of the human consciousness and thereby to repress vital Human Development. Gnostics suggest that appreciating God is a process of accumulating vital quality-of-survival related knowledge, through critical observation, and is not about "blind faith". Having "blind faith" is the inculcation of self-imposed ignorance, which does not bring humanity closer to God, as presented by manipulative elites in fascistic religious organizations. Instead, in the apparent view of the Gnostics, such "faith", is orchestrated to move humanity further away from God, so that humanity can be "jerked around" by hideous intelligences. In contrast, Gnostics recognize the critical pursuit of an appreciation of God to be essentially a "scientific exercise". Gnostics appear to appreciate understanding the complexity of reality, which empowers humanity through critical knowledge of the universe, requires scientific study, inclusive of spiritual phenomenon. In the apparent view of Gnostics, Christianity and official "science", are created around a prism of Western dogma, which requires the denial of Extraterrestrials. In the apparent view of ancient Gnostics, that denial is fostered, in order to perpetuate ignorance of God; and that in turn, is used to enforce systems of oppression jointly perpetuated by science and Christianity.